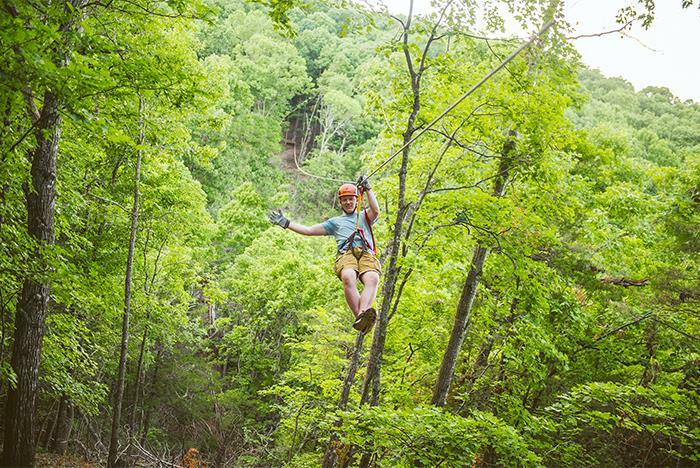 There’s no better way to take in the Ozark terrain than from the treetops! 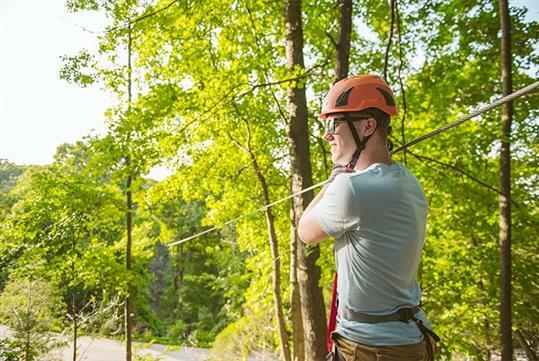 The all-new Zipline Canopy Tour at The Shepherd of the Hills allows you to zip from tree to tree and stare at the mesmerizing views from tree-suspended platforms along the way. Visitors must be at least 3 years old to participate. 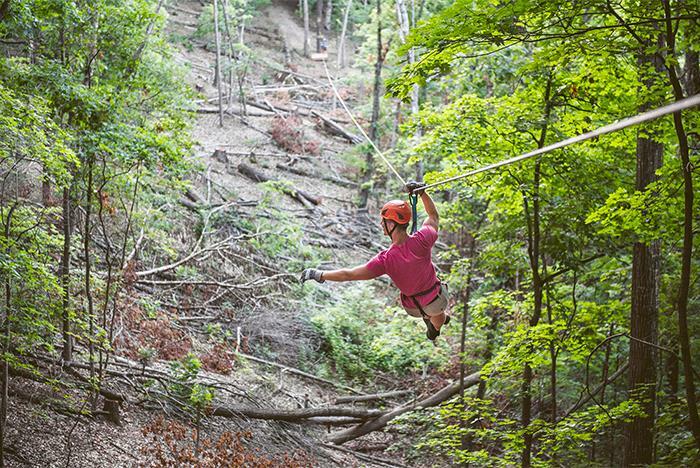 Ziplining is available from Tuesday to Saturday and reservations are encouraged. Participants must be at least 3 years old to zipline. Guests cannot exceed 250 lbs to participate. Ziplining is available from Tuesday to Saturday. Tour Times: 10:00 am, 12:00 pm, 2:00 pm, and 4:00 pm. Each tour can accommodate 10 people. Enjoy the beauty of the Ozark terrain as you soar from tree to tree on the all-new Zipline Canopy Tour at The Shepherd of the Hills. Guests will experience breathtaking views and thrills as they zip their way across the horizon from unique tree-suspended platforms. Zip-able hours are from 10:00 am to 4:00 pm, Tuesday through Sunday and reservations are recommended. Zipline Canopy Tour includes admission to Inspiration Tower. Weight Limit is 250 pounds. How long do the zipline tours last? Zipline tours can last anywhere from 30 minutes to 90 minutes long depending on the tour you select and the size of the group. What should I wear for the zipline tour? Closed-toe shoes, pants or shorts, and a comfortable shirt. Flip flops, sandals, and skirts are prohibited. How much physical effort is involved in the ziplining tours? 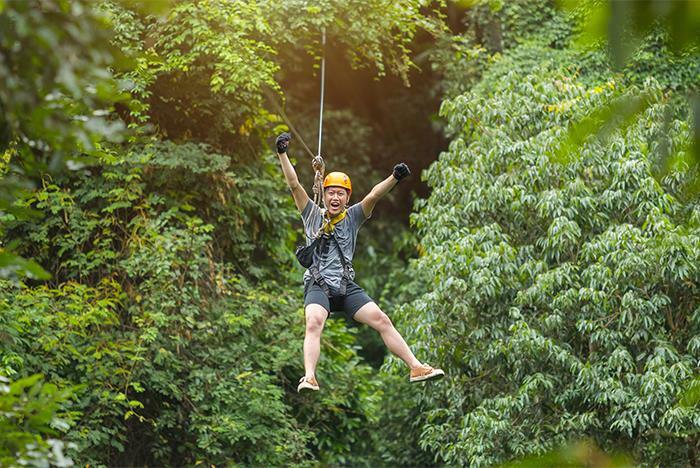 Ziplining requires upper body effort as you will have to hold yourself upright, be able to break using your hands, and stand for moderate periods of time. I am pregnant. Can I still participate? Can people with health issues still participate in the tour? It depends on the health issue, but it is not recommended overall. Does ziplining have any age or weight restrictions? Yes. Guests must be at least 3 years old and not exceed 250 lbs. Does the tour run in inclement weather? Do I need prior ziplining experience? No. The short four ziplining tour is perfect for beginners. Will I need to sign a waiver?